A recent trip to Brazil’s Northeast coast was where I fell in love with this country. Culture…food…music…art…dance…beautiful weather, and beautiful people—it has it all. And I discovered two of my favorite Brazilian towns—Pôrto De Galinhas and Olinda. The towns are a 90-minute drive from one another, with the city of Recife (the capital of the state of Pernambuco) nestled between the two. Pôrto De Galinhas is the place to spend your days on the beach. Think crystal clear waters, light powdery sand, and a friendly atmosphere. A day of shopping in town is also a must. Shop the work of local afro-inspired artists or pick up typical Brazilian goodies like hot sauce, honey and of course Cachaça—the famous Brazilian rum—made locally. The natural swimming pools in Pôrto De Galinhas really wowed me. The protected reef, spanning about a half mile along the coast, reveals natural pools at low tide, which you can walk to and swim in, or pay a local guide along the shore about $5 to paddle you out on a small, handcrafted sail boat (there are many of them along the beach, you can’t miss them). The guides carry fish food with them, which you can use to attract an amazing variety of tropical fish. The pools are magical for snorkeling enthusiasts and rookies alike. We were surrounded by entire schools of fish during our trip out to the piscinas naturais. 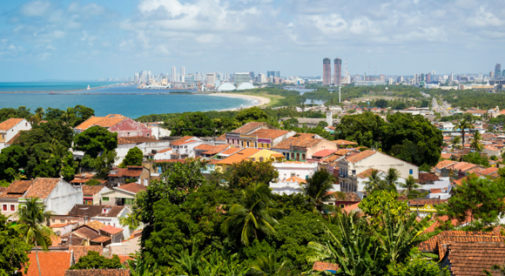 North of Pôrto De Galinhas is Olinda, where equally picturesque views of the Atlantic ocean are amplified by the hilly terrain allowing you to take in the views of the town from above. One of the best view points is also where you’ll find the Catedral Sé de Olinda, Brazil’s very first church. Founded in the 16th century by the Portuguese, Olinda was rebuilt after being looted by the Dutch. Much of the architecture and fabric of the city that exists today dates back to the 18th century. I was inspired by all the measures that have been taken to preserve this beautiful town, including a movement founded and carried out by residents called Resiste Estelita, which is essentially a ban on new construction and modern development. From art galleries and museums to historic churches and homes, the character of this city is exhilarating. Despite the common belief that Rio De Janeiro is the best place to be in Brazil for the annual Carnaval celebration, I learned that Olinda is actually home to one of the most famous and popular Carnaval celebrations in the country. The region is hailed for its diversity in music and dance styles, including frevo which was developed toward the end of the 19th century in Recife, and has both Spanish and Afro-Brazilian origins. Each October, you can find various troops gathering in the city’s cobblestone streets to start practicing their repertoire of Brazilian dance and music styles for Carnaval, which takes place in February. You’ll also find low-priced street vendors throughout Olinda’s historic city center, selling all sorts of authentic Brazilian food, including feijoada (a stew of beans with beef and pork), pamonha (corn husks wrapped in a paste made from sweet corn and milk and boiled), as well as fresh açaí berries and of course caipirinhas in a variety of flavors. For a little taste of everything Brazil has to offer, these two Northeastern gems are well worth a visit.